Posted February 23, 2016 by Sue Peffer & filed under News, Services. Cambridge, UK – 23rd February 2016 – Cresset Discovery Services, provider of contract research services for early phase discovery, has developed an innovative clustering method that made it possible to assess the 3D similarity across BioBlocks’ virtual database of over 1.5 million fragments. 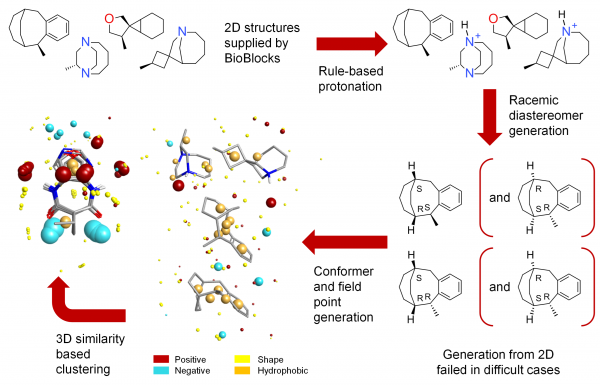 Cresset’s work enabled BioBlocks, a collaborative medicinal chemistry company, to design new fragment libraries with maximal coverage of 3D chemical space. The final result is a 3D fragment library that contains a significant number of compounds with novel core structures that are now viable targets for fragment generation. BioBlocks plans to release the first set of plates for fragment screening over the course of 2016. BioBlocks envisions this comprehensive fragment library to be a drug discovery tool available only to collaborators who will be able to leverage this new chemical space for their lead discovery programs and utilize BioBlocks’ collaborative medicinal chemistry processes that were developed to increase the probability of generating commercially viable leads.